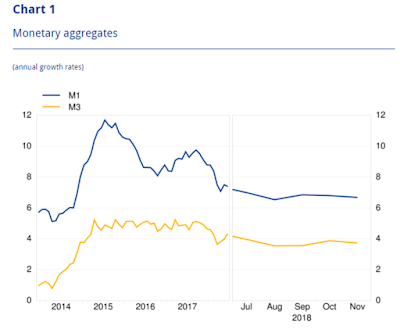 The annual growth rate of the broad monetary aggregate M3 decreased to 3.7% in November 2018 from 3.9% in October, averaging 3.7% in the three months up to November. The components of M3 showed the following developments. 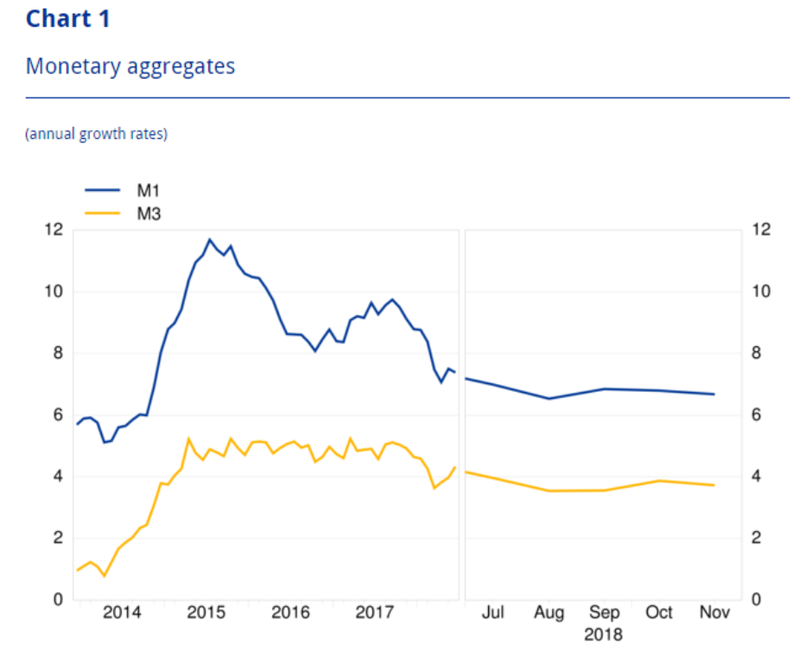 The annual growth rate of the narrower aggregate M1, which comprises currency in circulation and overnight deposits, stood at 6.7% in November, compared with 6.8% in October. The annual growth rate of short-term deposits other than overnight deposits (M2-M1) stood at -1.0% in November, unchanged from the previous month. The annual growth rate of marketable instruments (M3-M2) was -6.0% in November, compared with -4.6% in October. Looking at the components' contributions to the annual growth rate of M3, the narrower aggregate M1 contributed 4.4 percentage points (as in the previous month), short-term deposits other than overnight deposits (M2-M1) contributed -0.3 percentage point (as in the previous month) and marketable instruments (M3-M2) contributed -0.3 percentage point (as in the previous month). From the perspective of the holding sectors of deposits in M3, the annual growth rate of deposits placed by households increased to 4.9% in November from 4.7% in October, while the annual growth rate of deposits placed by non-financial corporations decreased to 3.7% in November from 4.1% in October. Finally, the annual growth rate of deposits placed by non-monetary financial corporations (excluding insurance corporations and pension funds) decreased to 0.5% in November from 3.0% in October. 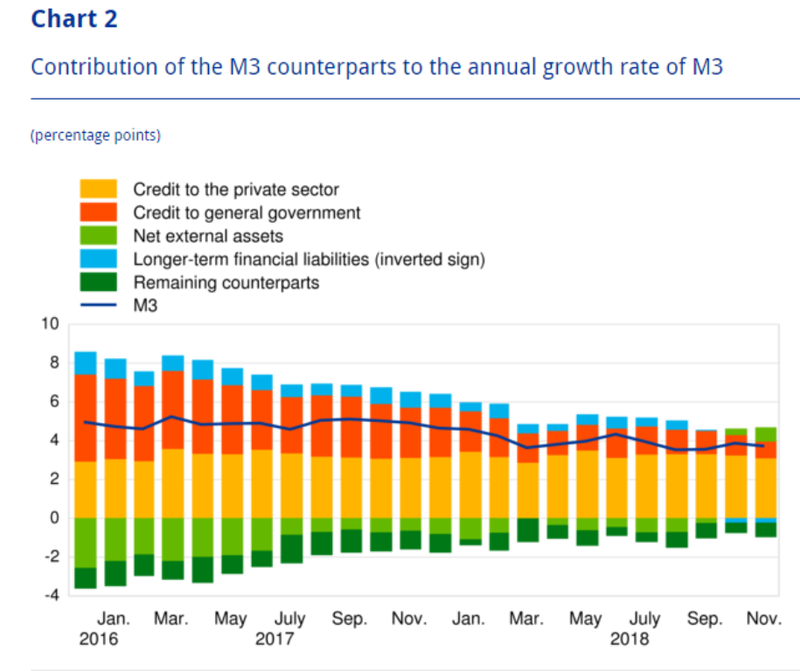 As a reflection of changes in the items on the monetary financial institution (MFI) consolidated balance sheet other than M3 (counterparts of M3), the annual growth rate of M3 in November 2018 can be broken down as follows: credit to the private sector contributed 3.1 percentage points (down from 3.3 percentage points in October), credit to general government contributed 0.9 percentage point (down from 1.0 percentage points), net external assets contributed 0.7 percentage point (up from 0.3 percentage point), longer-term financial liabilities contributed -0.2 percentage point (as in the previous month), and the remaining counterparts of M3 contributed -0.7 percentage point (down from -0.5 percentage point). As regards the dynamics of credit, the annual growth rate of total credit to euro area residents decreased to 2.7% in November 2018 from 2.9% in the previous month. The annual growth rate of credit to general government decreased to 2.2% in November from 2.7% in October, while the annual growth rate of credit to the private sector decreased to 2.8% in November from 3.0% in October. 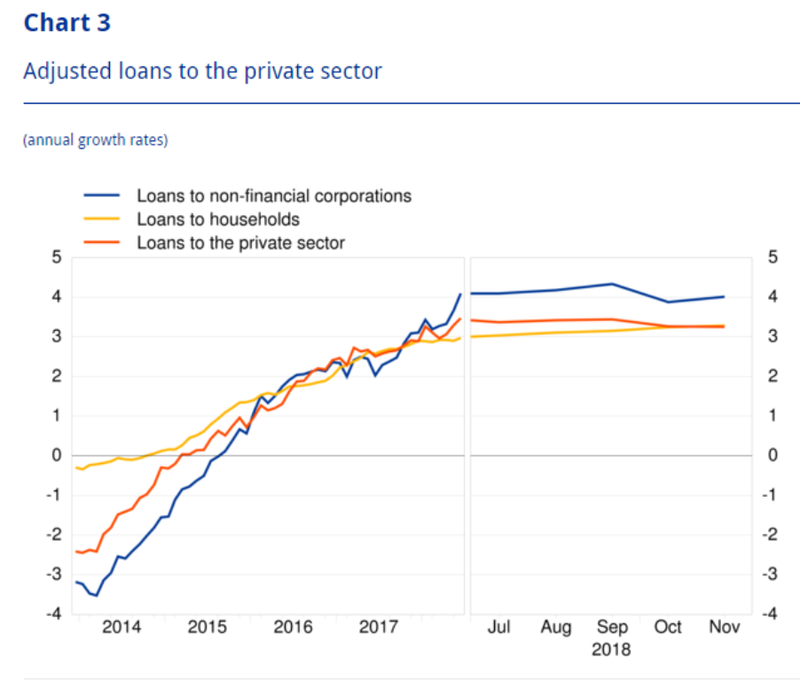 The annual growth rate of adjusted loans to the private sector (i.e. adjusted for loan sales, securitisation and notional cash pooling) stood at 3.3% in November, unchanged from the previous month. 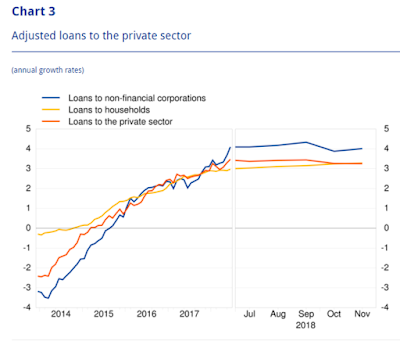 Among the borrowing sectors, the annual growth rate of adjusted loans to households stood at 3.3% in November, compared with 3.2% in October, while the annual growth rate of adjusted loans to non-financial corporations stood at 4.0% in November, compared with 3.9% in October.